The release of historical NZ stamp designs (from the 1898 and 1935 pictorials), surprisingly effective in large wall art size - see our previous article "Postage Stamps to Wall Art" - prompted further discussion with artist Lester Hall about his groundbreaking "postage stamp" series of prints. 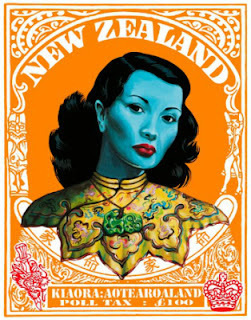 Back in June we had described how this controversial contemporary NZ print-maker used the conventions of postage stamp design to explore issues of Maori and Pakeha identity and that thanks in large part to his popularisation of the idea the postage stamp style print has become a "veritable trend" in NZ art. We asked Lester Hall when he began to create prints that used the conventions of postage stamp design? Hall said that it was back in 2008 "I set several images first so they were in a context of stamps like any other set of stamps. 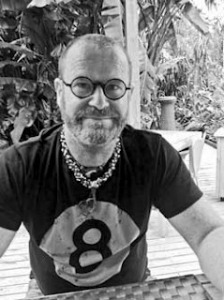 The statement was about being Pakeha and I made a commitment to update the "Hories and Whities" series of diary pages I had done (in the late 80s and early 90s). These were an investigation into Being Pakeha." Hall said "The stamp style was my drawing a line in the sand, it says I am clear about the thoughts surrounding the images. Stamps were immediately historical in context. I shifted from diary pages which were from a place that was private and self analysing to stamps because stamps are statements, not questions." Talking to Hall it became clear that for this artist the referencing of postage stamps in his art was not just about designing each individual artwork to echo a stamp's design in isolation, but also to "insinuate the possibility of collecting". Hall said that beyond the obvious connotations of collecting prints "this collecting idea is about putting several important hypotheses together to form a philosophy." With Hall agreeing that the format is becoming ubiquitous, (he says the stamp design is "losing its edge"), we asked Lester if there is scope to develop artistically within the stamp design theme? Some recent works such as Queenie are not strictly in the stamp format so is this design becoming restrictive in any way? Hall said "First and foremost I am a social commentator so the artistic imperative comes a distant second to my narrative. I am moving in a sideways direction now, into book covers and posters but the subjects I create will be able to revert to stamp when I think it is important for the context of people already collecting stamps. Queenie is formatted into an Argentinean designed stamp and is exactly as that Victorian era stamp was created. That artist just thought outside the square so to speak." And what does Lester think of other NZ artists who are now also referencing postage stamp design? "Use a format by all means", he told us "but to imitate colour way, style and subject so closely - this is not derivative it is creepy!". Of course an actual Lester Hall print is quite distinctive from the imitators copying old NZ stamps in mass produced frames, no other artist is creating such a coherent different series of artworks to stimulate and inform debate about the place of Pakeha in New Zealand. As Lester says "The place of Pakeha in New Zealand is a complicated and evolving understanding. My subjects vary because of the lighter and darker sides of that setting. I create differing feelings of happiness or danger etc to draw in a wide audience and to ask people to be brave and think for a change and maybe speak about their desires and hopes and expectations. So where an image of the Buzzy Tiki can relax and draw in a mind living in a lighter World the devilish print of the Boogieman will find its way into the more brooding contemplative mind which peers deeper into the souls of man. The differences are driven by a desire to have a broad perspective and creating a deepening trust of the subject in us all." So where is the art of Lester Hall headed now? "Fashion", he says "exists in all art and as it heads towards the darker and more morbid forms of the Victorian so will mine."